Even though I haven’t been going to an office daily, I have been extremely busy for the last few days. So I’ve still been getting dressed and going out and I’ve been going back to doing my eye makeup. Due to summer’s heat and humidity I was obsessed with eye liner (liquid or pencil) for the last 2 months but I truly love eye shadow. Yesterday I did a great eye but didn’t take great close-ups but thought I’d share the 2 colors I’ve been obsessed with for the last week. 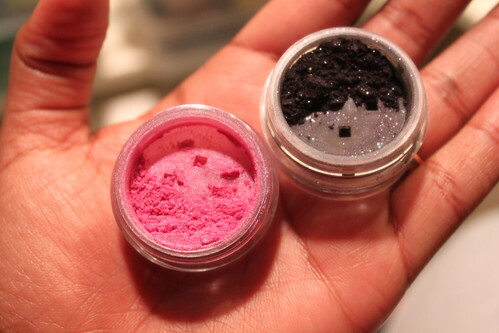 Bare Escentuals Wildflower (left) and Deep Amethyst (right) which is no longer available. Wildflower is this iridescent magenta that can appear a bit lilac in the light. LOVE IT. You may remember it when I used it in the Beauty Challenge. I’ve been sweeping it across my lid and then using the Deep Amethyst to create a smoky eye. The Amethyst is such a gorgeous dark purple with just the write amount of shimmer to it. I’m becoming obsessed with purple for fall makeup. It’s vampy but still wearable for day. I get stuck on specific colors for weeks at a time. I’ve been loving purple for the last week but I feel a teal streak coming up in the future. Do you get hooked on certain colors too? What’s your favorite right now?